Adult apterae of Stomaphis graffii are covered in white wax powder giving them a greyish-yellow appearance (see pictures below). The densely hairy 6-segmented antennae have segment VI (including the terminal process) shorter than segment V (cf. Stomaphis quercus & Stomaphis wojciechowskii which both have antennal segment VI longer than segment V). There is no extensive sclerotisation of segments anterior to siphunculi either dorsally or ventrally (cf. Stomaphis quercus & Stomaphis wojciechowskii which both have a longitudinal series of paired pigmented spinal sclerites on the dorsum). The genital plate is divided into two (cf. Stomaphis quercus & Stomaphis wojciechowskii which both have the genital plate entire). The body length of the adult Stomaphis graffii aptera is 4.2-6.5 mm (cf. Stomaphis quercus or Stomaphis wojciechowskii which are 5.3-7.0 or 5.2-6.8 mm). Images copyright Julian Hodgson, all rights reserved. Stomaphis graffii acerina on Acer pseudoplatanus. However, neither molecular nor morphological data support this distinction, and Depa & Mróz (2013) have proposed they are synonomized. 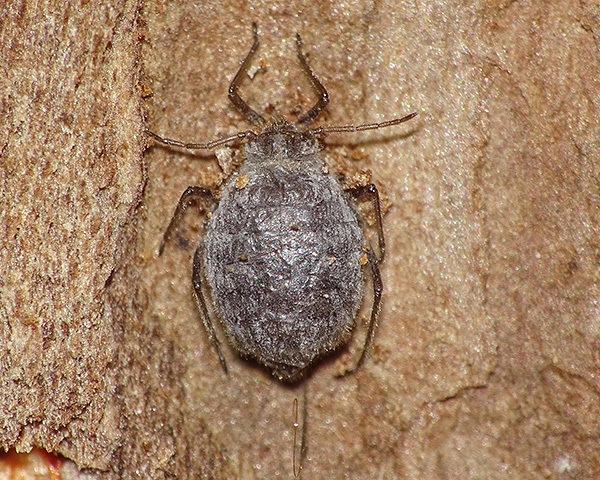 The giant maple aphid is found in deep bark crevices or under bark in ant chambers on the trunks of maple trees, usually field maple (Acer campestre), Norway maple (Acer platanoides) or sycamore (Acer pseudoplatanus), often at or below soil level, where they are attended by Lasius brunneus. Oviparae and dwarf apterous males have been collected from mid-August to November. 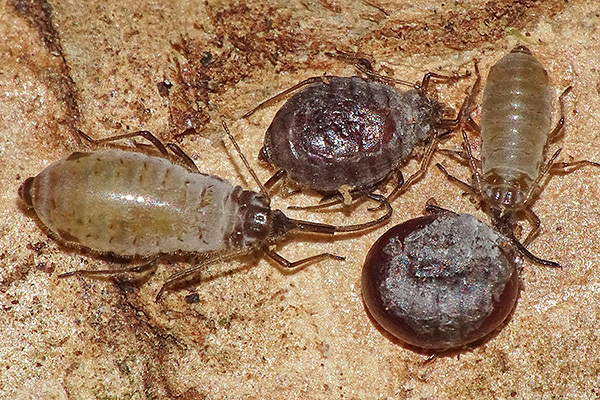 In Britain Stomaphis graffii had until recently only been found in Worcestershire, but has now been found in Cambridgeshire and possibly in Middlesex. It is widely distributed in continental Europe (France, Italy, Poland, former Czechoslovakia, Rumania, Ukraine), and east to Georgia. 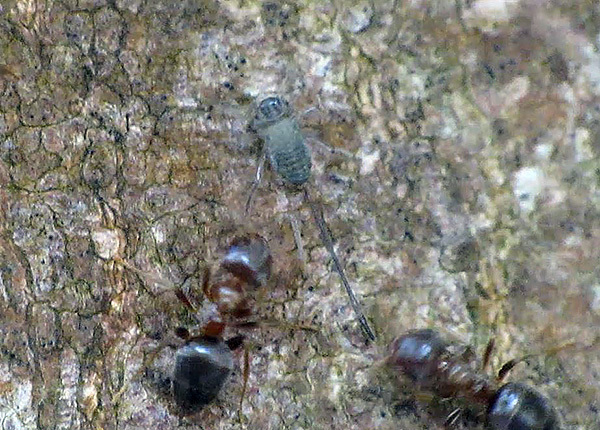 In 2017 Phil Attewell observed (and filmed) an immature Stomaphis on a sycamore trunk at Bentley Priory Nature Reserve near Stanmore in Middlesex (a still from his video is below). The very long rostrum of a Stomaphis is clearly visible. Stomaphis graffii immatures are usually pale yellow, so the green colour is atypical. Male Stomaphis graffii are described as light to dark olive green (Depa et al., 2015) but the Middlesex observations were made in spring (May 15th 2017) so it is very unlikely to be a male. Identification of this Middlesex Stomaphis must remain uncertain until more observations are made. In September 2018 Julian Hodgson found Stomaphis graffii on sycamore at Holne Fen, Cambridgeshire and on field maple (Acer campestre) at Monks Wood NNR, Cambridgeshire. They were found by searching the base of field maples looking for Lasius brunneus and/or evidence of ant soil on the bark. Only a small proportion of field maple trees hosted Stomaphis graffii, but at Holme Fen 3/5 sycamore trees had populations. 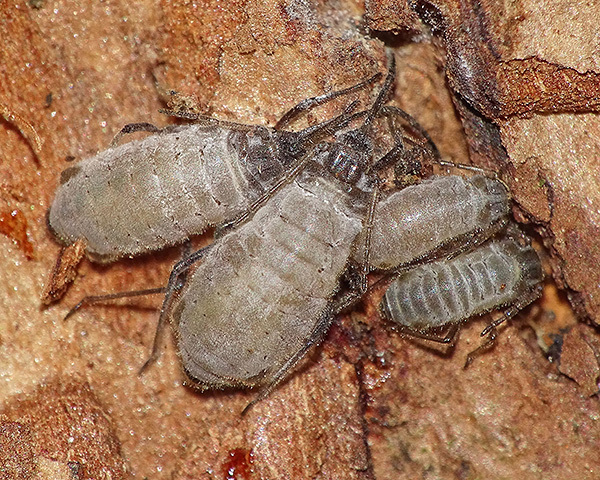 The only specimen found walking openly on the bark was a male observed walking on the trunk after dark. In Poland Depa (2012) noted that although several long term studies of aphids inhabiting urban greenery and parks had been conducted, no Stomaphis species feeding on trees had ever been recorded, nor were the alate morphs caught with yellow water traps. In fact only 6 sites for Stomaphis graffii were known from Poland. Yet during only nineteen days of careful and detailed research, Depa found 10 new sites and 36 separate colonies of Stomaphis graffii. He noted that all of the parks in Katowice were planted during the 1950s and 60s, so their presence there had to be the result of dispersal flights. Depa commented that the main problem with detecting Stomaphis graffii is its cryptic life habit. It feeds either at ground level in ant chambers covered by soil, or under the bark. When it feeds on sycamore, it can be found relatively easily as the bark of this plant species breaks into smaller scales with empty space under them. The edge of such a scale is covered by soil and aphids feed in ant chambers created in this way. Removal of the bark scale is easy, although aphids feed only in some of such chambers. It is much more difficult to find aphids on other Acer species, because their bark is hard and stiff. Yet ants manage to build chambers in their crevices, inside the bark or under it. 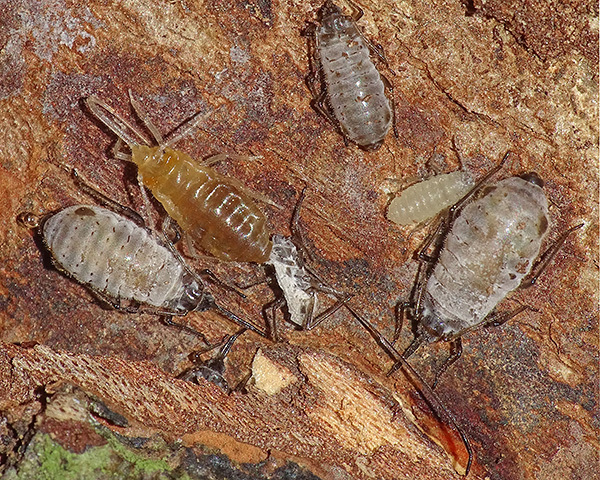 Removal of bark to uncover aphids in these chambers is only possible with a solid knife. Depa (2013) described the life cycle of Stomaphis graffii in Poland. The first offspring of fundatrices were observed in the final third of April and the first adult apterous viviparous females from the middle of May. These viviparae (fundatrigeniae) then produced both apterous and alate viviparous females, with the immature alatae appearing from the beginning of June. However, alate females were very sparse, with only single individuals recorded within colonies, or not at all. Those collected in June and July were slender and were not feeding, instead flying off after their covering chamber was removed. Alate females feed rather high on the trunk, whereas apterous females may feed at different heights, but often near ground level. This is in agreement with observations by Takada (2008), who reported the alate females of Stomaphis japonica moving up oak trunks when preparing to emigrate to their secondary host. He concluded that the alate females take off from the treetop, and suggested that the most adaptable way of dispersal for large, tree-trunk feeding aphids may be to climb to the top of the tree and undertake short flights from tree-top to tree-top, with a higher probability of landing on a branch in the dense tree-top layer of the forest. For Stomaphis graffii, a series of single flights would be needed, since the field maples are scattered among the dominant oaks and hornbeams. Only when it encounters its host plants and attendant ant species, usually Lasius brunneus, does it descend the tree, start to feed, and establish a new colony. 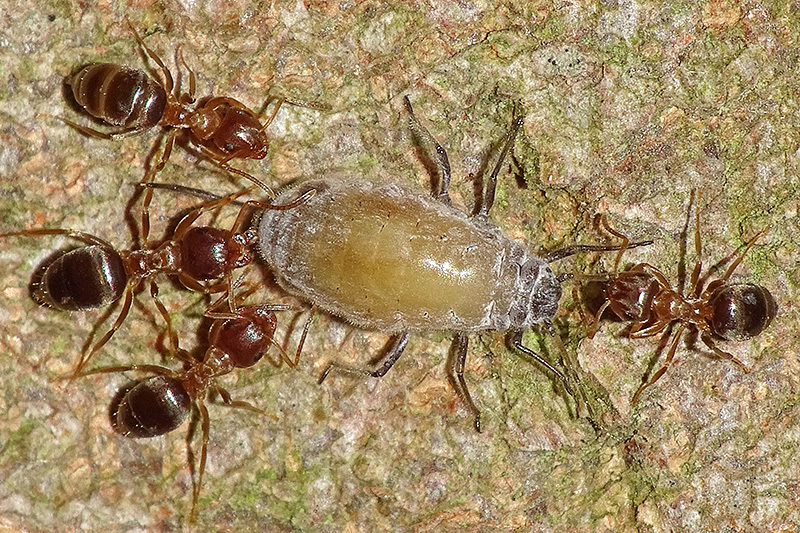 As obligate myrmecophiles, Stomaphis species face the problem of needing to find an appropriate mutualistic ant species to enable establishment of a new colony. This is quite difficult for Stomaphis graffii because Lasius brunneus has very restricted area of foraging, unlike Lasius fuliginosus, which forages some distance from its nest. It is not yet known whether Stomaphis use any chemical stimuli to find their find their ant partner. Apterous viviparous females were present in Poland until October, and at the end of July and beginning of August, sexuparae appeared among them. The sexuparae were morphologically indistinguishable from viviparae, but their presence was established by direct observation of them giving birth to males, which occurred in the final third of August. Young males remained with the sexuparae some time after birth. Mating took place during the first half of September, and from the end of September and throughout October, oviparous females, males (see picture above) and eggs were simultaneously found in each of the studied colonies. In some cases young larvae were still present until the beginning of November, but it was unclear whether they were young oviparous females or viviparous females. The eggs were deposited under the bark, not higher than 0.5 m above ground level, often at the trunk base, sometimes just below ground level, in ant chambers and in clusters of about 20 eggs. It is possible some apterous viviparous females may continue to feed and reproduce, although no such specimens were collected. At least one species of the genus Stomaphis acquerinoi may occur on Acer throughout the year as parthenogenetic generations, overwintering as alate females (Binazzi & Pennacchio, 2002). Stomaphis aphids have developed an obligate mutualistic relation with ants, predominantly those from the genus Lasius (Formicinae). 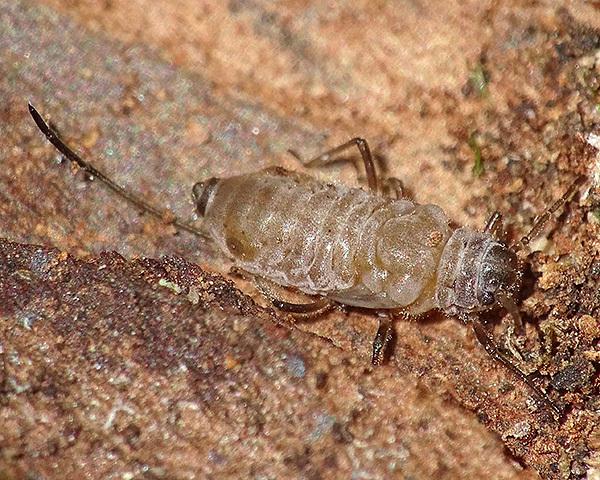 Stomaphis graffii is associated mainly with Lasius brunneus (see picture below), although attendance by Lasius fuliginosus may also occur (Depa, 2013). The aphids cannot survive without the protection from the ants (Lorenz & Scheurer, 1998). The Cambridgeshire Stomaphis graffii were attacked by a parasitoid. As was the case for Stomaphis wojciechowskii the mummies appeared to match the description and photo of the Protaphidius wissmannii mummy given by Kovács (2009). One part of the defense strategy of Stomaphis graffii against Protaphidius wissmannii is the concealed nature of its habitat within the ant tunnels and galleries. This is combined with the defensive actions of the attending ants, which may bite off the antennae of investigating parasitoids. Bilska et al. (2018) suggests these aphids have adapted another type of defensive behaviour against predators known as thanatosis (also termed 'death feigning' or 'playing possum') - which acts by enhancing Stomaphis graffii's close association with ants. 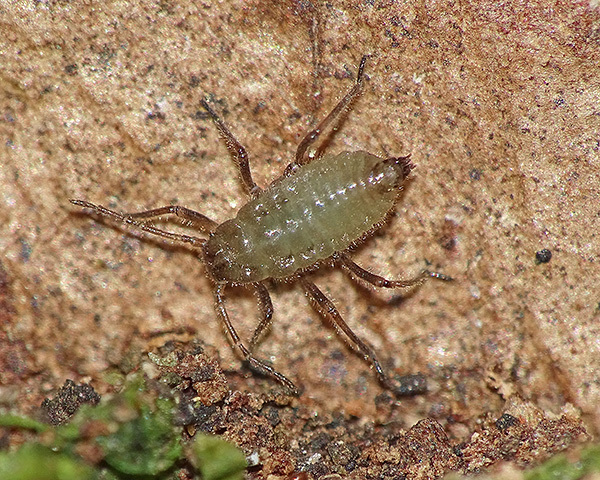 They describe experiments on the behaviour of Stomaphis graffii in which individual aphids were turned on their backs. The aphids responded by moving their appendages vigorously trying to turn back. They were then touched with a needle, whereupon the aphids instantly curled their legs towards the abdomen, a movement described by Bilska et al. as 'shrinking'. The antennae were put along the body, with the tips doing slight circular movements. The aphids stayed like that for a few seconds, and then returned to full activity. Bilska et al. noted that curling the legs towards the body resembled the pupa-like position of submissive ant workers, and argued that the thanatotic response had been transformed to facilitate transport of the aphids by an ant worker in soil tunnels. 'Shrinking' made the aphid a more compact, transportable package, and reduced injuries to the aphids. The slight antennal movement may be telling the ant : hey, I'm alive, take me where you wish! Stomaphis graffii has been recorded from 5 Acer species (Acer campestre, Acer platanoides, Acer pseudoplatanus, Acer tataricum, Acer velutinum). It is mainly found on field maple (Acer campestre), Norway maple (Acer platanoides) and sycamore (Acer pseudoplatanus). It may also occur occasionally on other Acer species such as silver maple (Acer saccharinum) Depa (2013). Of those aphid species, Baker (2015) lists 16 as occurring in Britain: Aphis craccivora, Aphis fabae, Aulacorthum solani, Drepanosiphum acerinum, Drepanosiphum aceris, Drepanosiphum dixoni, Drepanosiphum platanoidis, Mimeuria ulmiphila, Periphyllus acericola, Periphyllus aceris, Periphyllus californiensis, Periphyllus hirticornis, Periphyllus obscurus, Periphyllus testudinaceus, Stomaphis graffii and Stomaphis longirostris. Blackman & Eastop list 12 species of aphid as feeding on European sycamore (Acer pseudoplatanus) worldwide, and provide formal identification keys. Of those aphid species, Baker (2015) lists 8 as occurring in Britain: Aulacorthum solani, Drepanosiphum acerinum, Drepanosiphum dixoni, Drepanosiphum platanoidis, Macrosiphum euphorbiae, Periphyllus acericola, Periphyllus testudinaceus. and Stomaphis graffii. We especially thank Julian Hodgson, and Phil Attewell (county recorder of ants for Hertfordshire) for the images shown above. Binazzi, A. & Pennacchio, F. (2002). On the biology of Stomaphis acquerinoi Bnz. from Tuscany (I) (Aphididae Lachninae). Redia 85, 205-212. Blackman, R.L. et al. (in press). Aphids - Anoeciinae, Lachninae, Eriosomatinae, Phloeomyzinae, Thelaxinae, Hormaphidinae, Mindarinae. Handbooks for the Identification of British Insects 2(8). Royal Entomological Society of London. Lorenz, H. & Scheurer, S. (1998). Biology and generation-order of Stomaphis quercus (Lachnidae) living on Betula pendula near Berlin, Germany. pp. 243-250 in: Nieto Nafria J.M. & Dixon, A.F.G. (eds), Aphids in Natural and Managed Ecosystems. Secretariado de publicaciones, Universidad de León.